Deep etched engraved personalized "label"
Our lead-free glass will accentuate the rich color of your favorite single malt or whisky blend. Custom engraved with a label style personalization. Our master glass carvers deeply carve each decanter and glass so that each piece is the perfect gift for those seeking unique gift ideas for whiskey lovers. Ideal for groomsmen, birthday or wedding gift. What is the volume of the glasses? Also, do you have dimensions? Can I get express or overnight shipping ? BEST ANSWER: We do offer express shipping, I suggest you call our customer service department at 800.648.6058 and they can assist you with this. Thank you. In one place it says set of 4, yet in another it says set of 2. Hmmm? 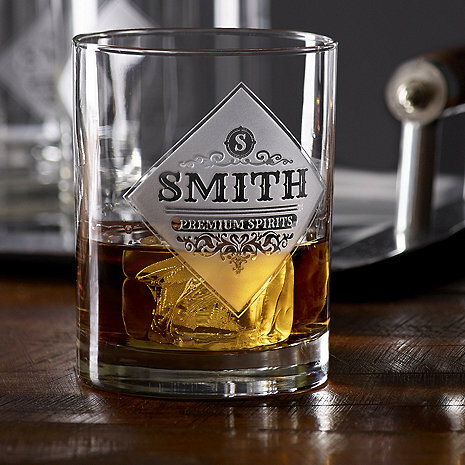 BEST ANSWER: The Personalized Etched Premium Spirits Whiskey Glasses (Set of 4) do come as a set of four. I decided to order these for my boyfriend, who's a big whiskey aficionado. He loves them! He loves showing them off when guests come over. I highly recommend them! I bought the class and decanter set and my husband LOVES them. Great glasses. Perfect addition to my new bar I just finished.